1 - 25 of 2892 results for "Logs"
Softwood Logs - Yellow Pine Logs. 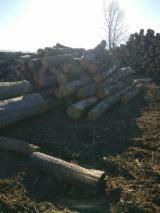 Acacia Logs, Saw Logs, 8 - 25 cm Diameter. Offer Teak Fresh Sawn Logs or Peeling Logs, Grade A From India.